delivered only for personal or family use. DVdate is a utility for handling avi files in general, and avi DV files in particular. convert a type 1 DV file into type 2 (or reciprocally): This is useful for importing a file into some video editing software that only accepts Type 2 videos, eg Studio Pinnacle. DVdate even recognizes some strange types of DV, especially those produced by Movie Edit Pro and convert them to standard DV. convert a non-DV file to a DV file (Pal or NTSC): this is useful when editing in DV to easily introduce a video clip that was compressed into something else, for example DivX or Mjpeg. convert a DV file from Pal to NTSC or vice versa: this is useful for making a DVD in NTSC from a DV camcorder. It can also convert 4×3 to16x9 and vice versa. embed the datecode in the images of a DV video: this is useful to display the capture date in a corner of the image, as the analog camcorders did. But we can also do very sophisticated inlays with timecode, datecode and custom text. 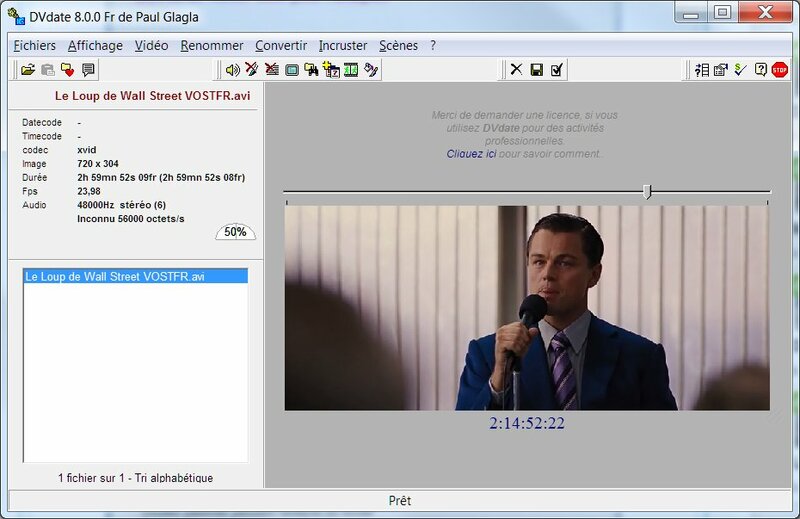 create a .srt subtitle file containing the overlay: instead of permanently embedding the datecode, you can automatically create a .srt file containing the same information as subtitles, and then activate them when you read the video in most media players. This can also be used to create subtitles for a DVD. export a file containing the scene list of a DV video: this file can be either a Windows text file, a Word or Excel file, or an OpenOffice.org file (Writer or Calc). This is very useful for making a catalog of its DV tapes, or even a database. correcting the video frequency (framerate) of an avi file: this is useful for fixing some synchronization problems between sound and audio, when an analog card has created a video with a wrong frequency. Rename avi DV files by integrating the datecode or the timecode in their name: it is useful to classify video clips according to their date of shooting for example. DVdate can do many other things: extract audio to a Wav file, correct a codec, adjust the datecode for a time difference, split a DV file into as many clips as scenes, etc. DVdate includes a multimedia player that allows you to play the video (including full screen) and easily navigate through the video with the CTRL + keys on the keyboard, eventually navigate from scene to scene (keys function F8 or F9). It displays in real time the datecode and timecode of the image being read. DVdate also displays very comprehensive information about the properties of the AVI file. In the manner of the utility Gspot, it provides the codecs, the size of images, the number of images per seconds, the duration etc …, but when it deals with files in format DV, it adds type 1 or 2 and the Pal or NTSC standard, or even the ratio 4×3 or 16×9. It also includes a function to display the RIFF header of the avi file, like Microsoft’s riffwalk.exe program, which is now very difficult to find. DVDate makes it easy to load a large number of avi files into its “playlist”, to treat them together or individually. It can load them into the multimedia application of your choice by simply pressing a F3 or F4 key. It automatically displays the corresponding video when you select one. It even allows a single key (CTRL + F7) to load all avi files present on all hard drives. Try it, you’ll be surprised at the result. DVdate includes a scripting language that automates a large number of functions. DVdate also includes a scene editor, which allows (even for non-DV files, eg divx) to create an associated scn file, containing the beginning and the end of each scene, possibly with a title and a thumbnail, which makes it easy to navigate in applications that recognize these files, including DVdate, ImageGrab and of course Pinnacle Studio.